By looking at the latest fashion and style magazines, you will quickly read articles and view ads that say straight hair is back in style. However, for many women, straight hair has always been in style. Straight hair is a look that is a symbol of sophistication. Those who have hair that becomes unruly during humid and hot weather find it difficult to keep straight hair from becoming a frizzy mess. But, have you considered trying a permanent hair straightener for your hair? Rebonding has also become a very popular straightening treatment. You may be wondering what makes these treatments so different from a permanent hair straightener. 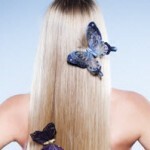 The process to permanently straighten the hair involves a combination of chemicals and heat. This type of treatment works on the hair shaft by breaking the bonds of the hair. The bonds are then placed back together in order to create the sleek look you want. If you want bone straight hair, and you have hair that is very curly, straightening may be the best option for you. This process involves straightening the hair by chemically relaxing it. The chemical treatment will change the natural structure of your hair and give it the appearance of looking ‘blown out’. Japanese straightening will leave your hair straight permanently, but the treatment may also cause damage to your hair. A smoothing treatment will change your hair’s texture and help make your hair more manageable. Those who have fine and thin hair will receive better results from hair smoothing. Women with thicker and curlier hair will see their mane become wavier after a hair smoothing treatment, but smoothing cannot make your hair completely straight. What Are Brazilian Blowouts And Keratin Treatments? These treatments promise to make hair straight, less frizzy, shinier and more manageable. Smoothing chemicals, along with flat irons and blow dryers are used in both treatments. As a result, the chemicals become bonded to the hair. A permanent hair straightener treatment is your best choice if you want sleek and smooth hair that is resistant to the harshest weather conditions. Transform your curls into the straight mane you want. Are you in the Atlanta area and you are looking for a professional stylist to straighten your curly hair? Contact Diana Pagan to schedule an appointment today.